High Tea: Owning A Golden Retriever...What To Expect? Owning A Golden Retriever...What To Expect? I am a person who loves gardening and I always do my best to devote even an hour everyday to tend my garden. I picked up all the dry leaves from plant to plant and make sure everything looks neat. 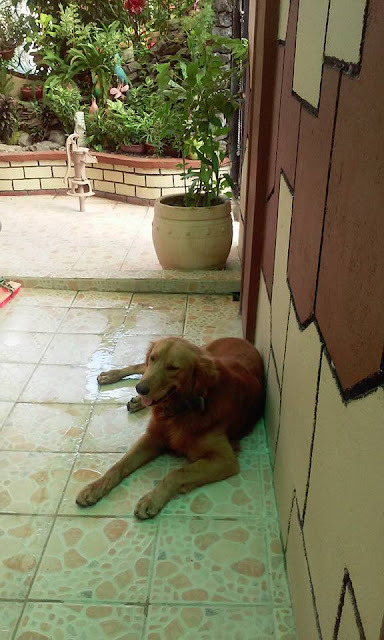 However, recently I am having problems with my garden as my Golden Retriever had developed the habit of digging the soil and destroying the plants in the garden. He would also break some clay pots lined up on one side of our garage. I have rearranged my garden several times as this very playful dog would always mess up with my plants. I've seen other Golden Retriever pets and they behave naturally. My GR is only 2 years old now and I was told that at the age of 4, they would start to behave and would not destroy things although their "playful ways" will still be there. Our GR has a robust body and can easily break things especially that he is so clumsy. We bought a Golden Retriever for our pet because my son wants this kind of breed because of their sweet and playful ways but I did not really expect that their "playful ways" can go to the extent of destroying or damaging things around the house. It's too late though as I have already learned to love this breed of dog. He could be so sweet and always flash that happy face every time you look at him which made me developed a certain level of patience on him. Golden Retrievers are people pleasers and will do anything to be praised, however they are too sensitive to strict way of disciplining and harsh tones. I am guilty of this sometimes as I have the tendency to raise my voice at an instant whenever I see that he had messed up on something. Since Golden retrievers adores people and depends largely on companionship, giving them proper care and attention is a must or they will grow up to be temperamental and would develop more tendency to chew things out of anxiety. Owning a Golden Retriever has done a lot of both good things and bad things for us but at the end of the day, we are still happy to have our dear Alonzo around as he is one of the sweetest and loving dogs that we ever had.